Win a FREE Springfree Trampoline this Sat! Home Directories	Want to win a FREE trampoline? Join Springfree Trampoline & CSP this Sat for Grand Opening! Want to win a FREE trampoline? Join Springfree Trampoline & CSP this Sat for Grand Opening! 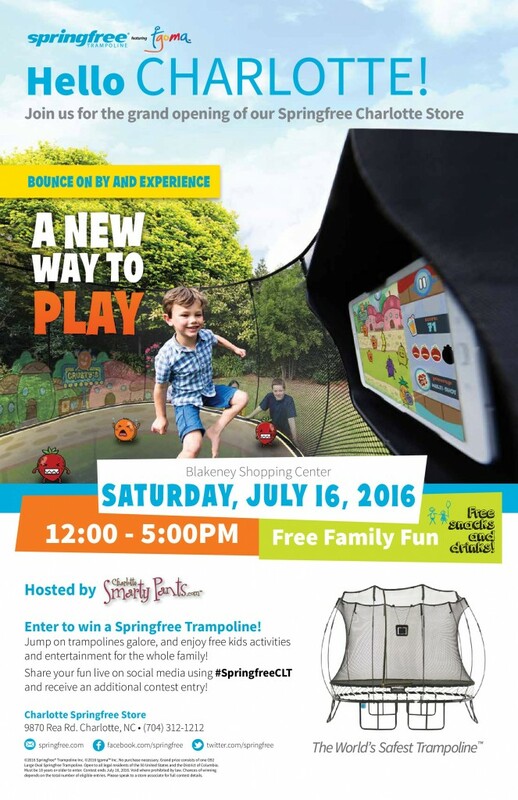 Itching to introduce ‘A New Way to Play’ to families in Charlotte just in time for the Summer season – Springfree Trampoline jumps in with tgoma technology THIS SATURDAY in Blakeney Shopping Center! Why: Attendees can enter for a chance to win a Large Oval Trampoline! Smarty Tip: Share #SpringfreeCLT during the event to receive an additional contest entry. Pick me, pick me! RSVP: You must RSVP here to attend the event. In our current, digitally saturated world, kids are spending 60 hours a week consuming media and less than 60 minutes a week playing in the backyard. Acknowledging these challenges that parents face, tgoma represents the first-ever outdoor interactive digital gaming system that encourages kids (and adults) to get outside and be active. This is an experience you are not going to want to miss out on, see video below. Potty Training Advice for Twins?